I'm just back from our Honolulu City Hall, where we spent three hours in two meetings with city officials. Our mission was to pitch Honolulu as a Nonviolent City. The delegation was organized by Ha'aheo Guanson, who teaches a course at the University of Hawaii called Gandhi, King, and Queen Liliu'okalani: the Power of Nonviolence. 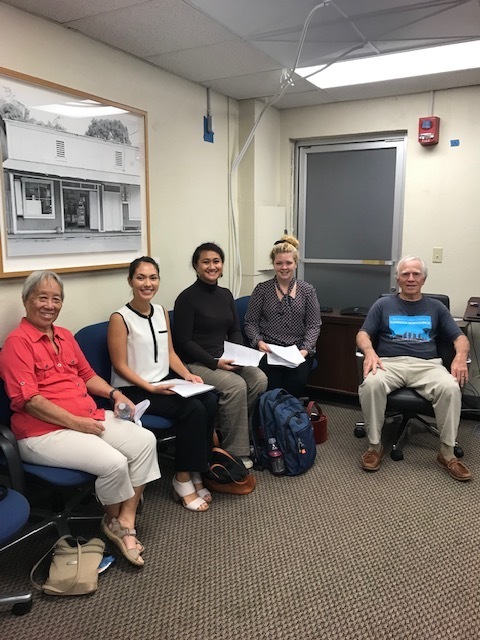 The main project this semester for her class of 20 students has been developing a plan for making Honolulu a Nonviolent City. Three students, representing their classmates, led the discussions this afternoon: first, in the office of a City Councilmember, whom both Ha'aheo and I have known over the years; next, in the office of the Mayor's Managing Director. The student's goal was quite simple: to get the City Council and the Mayor to issue proclamations declaring Honolulu a Nonviolent City. We figured we'd get about a 15-minute hearing in each office. To our surprise, we were greeted with enthusiasm and no time limits. The Deputy Managing Director, unbeknownst to us, had scheduled us to meet with three police officers and staff from various city departments. We all sat around a large table in a conference room and had a open discussion for well over an hour. I was extremely impressed with the way the students conducted themselves and the tone of the meetings! One idea that emerged was to have mayors of all four islands issue proclamations for their cities, and that maybe the Governor could proclaim the whole state nonviolent as well. As a jaded, retired government worker at both city and state levels, I joined the delegation with an attitude of guarded cynicism. Since I wasn't expecting much, I knew I wouldn't be disappointed. Instead, I walked out of City Hall in high spirits and with a sense of optimism that something might actually happen.